Published by Ebury Press in association with the Royal Horticultural Society in the UK, as hard back and ebook, and by Chelsea Green Publishing in the USA. The Book of Pears follows the pear's journey across continents and cultures, tracing its history and increasing status as a prized fresh fruit, celebrated for its luscious textures and exotic perfumes. The story includes the pear’s role as a market fruit and its position in the international fruit trade and also the use of other pear varieties for cooking and for making into the drink, perry. Illustrated with 40 water colour plates of pears by the renowned botanic artist Elisabeth Dowle and many period images. 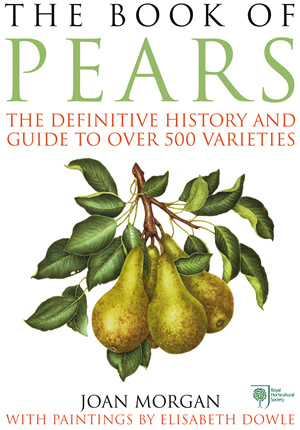 The second half of the book is a Directory to some 500 varieties of pear. Each variety entry includes tasting notes, together with its origin and history, as well as a fruit description for the purpose of identification and details helpful to its cultivation. The Book of Pears is the companion volume to The Book of Apples/New Book of Apples, which has been in print for over 20 years. This is also written by Joan Morgan, with Alison Richards, illustrated by Elisabeth Dowle and published by Ebury Press. Joan Morgan PhD is a pomologist and fruit historian, known internationally for her work on apples. Joan has been awarded the Royal Horticultural Society’s Veitch Memorial Medal, she is one of only 50 recipients of the Institute of Horticulture Award for ‘Outstanding Services to Horticulture’ and an Honorary Freeman of the Worshipful Company of Fruiterers. Joan Morgan is the author, with Alison Richards, of The Book of Apples, The New Book of Apples, A Paradise out of a Common Field: the pleasures and plenty of the Victorian garden and a main contributor to The Downright Epicure, Essays on Edward Bunyard edited By Edward Wilson. She has devoted many years to researching and compiling The Book of Pears. Elisabeth Dowle is an internationally respected botanic artist. She has been awarded seven Royal Horticultural Society Gold Medals, one of which was given for a selection of paintings included in this book and another for those in The Book of Apples. Her paintings are exhibited and collected world wide, held in many important institutions and selected for inclusion in the Florilegiums of Highgrove and Royal Botanic Gardens.